Aaaannnnndddd were back. Hello hello everyone, I know I haven’t posted much lately but that’s because I haven’t drunk or eaten at a fancy restaurant recently. I know, how shameful of me, but thanks for still checking out my blog. 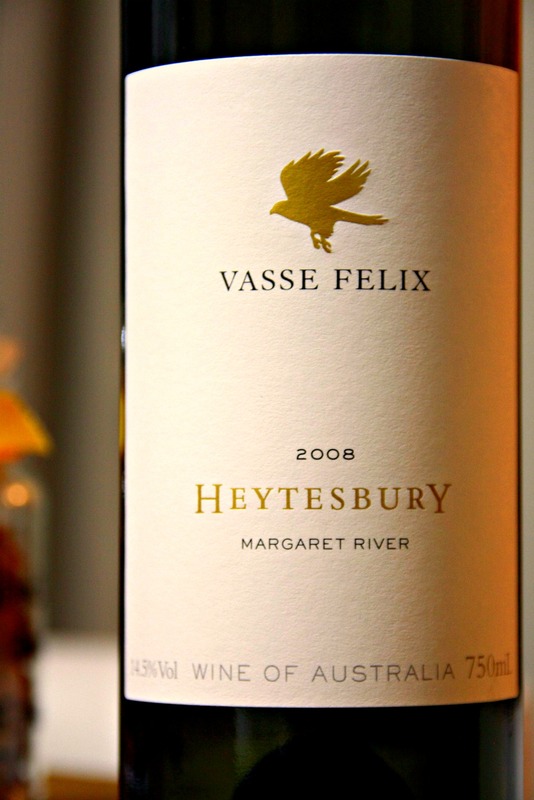 Well, I hope to make it up to you all but reviewing a pretty “up there” wine today, Margaret River’s Vasse Felix Heytesbury 2008. I must say, I’m been drinking a lot of Margaret River over the past few months and it’s a great place quickly becoming one of my favourite wine regions. The wines coming from that area have been sublime and Vasse Felix is its first winery way back is 1976 by Dr Tom Cullity. This is ment to be a small step down from the top end Cabernet players like Cullen and Moss Wood, but surely holds its own. It has gotten incredible scores, this vintage in particular ranging from 92 to 97 points which, by the way, are ridiculous scores. This wine is simply called Heytesbury because the percentages of the varieties used changes from year to year. The usual varieties are barrel selections of petit verdot, malbec along with the cabernet sauvingnon, matured in French oak with limited quantity. It’s synergy and blending is very important and is basically Vasse Felix’s signature wine. This vintage has 13% PV, 10% Malbec and the rest Cab Sav at 14.5% alc. I aerated this into a decanter for about 30mins. Straight off the bat, it’s got a very thick massive nose full of oak and so much vanilla. There is also a lot of toasted cashew nuts. There sweetness is very jammy, like slow cooked fruits almost like warm quince paste. Nothing will distract you from that vanilla and buttered toast/brioche character. The attach is a mix of sweet blue berries with a line of acidity lemon juice running through it. The mid palate is very very strong and powerful with extremely piercing and concentrated flavours of that jammy “overcooked” fruit and that line of lemon juice. There is also a thin layer of chalk on your tongue which gives a cedar note. The finish is floral and some steams, dried green leaf and tobacco leaf (think cigars) and then at the very end, some acidity. Initially I didn’t like it. It had a very typical flavour profile, felt like an expensive version of a Barossa wine. The more I drank, the more the flavours came out and showed the layers of the wine and complexity. Its power is the main thing about the wine and gives it an almost regal feature. Defiantly not for the faint hearted, loved by those you want to drink wine on its lonesome and full of bang. I recommend aerating this into a decanter and let it sit for a full 2 hours. This will get you into the complexity of the wine without wasting a drop. This wine goes for around $76. It’s not a bad wine, it’s actually very good and very impressive. Having said that, you can either spend a touch more and get a better wine, or, spend almost half and get a weaker version of this wine (of course with less complexity but still full in flavours and same general flavour profile). If it was $60, I think its great value buy. At this price, I find it difficult to not spend the extra $20 and get a better wine. Please note i’m not saying don’t drink this, please do, it’s a great wine, but you gotta think monetary wise also.